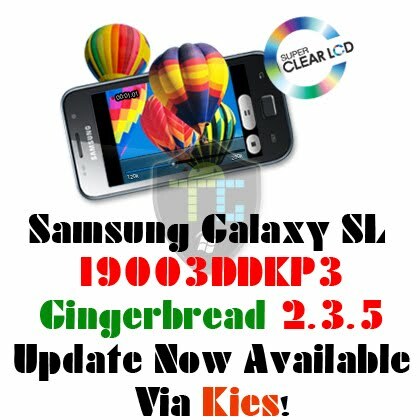 Samsung India has finally pushed the much awaited Gingerbread update for Indian Samsung Galaxy SL I9003 users. Samsung Galaxy SL is an Android 2.3.5 (Gingerbread) version. After waiting for more than six months there will be a smile on Samsung Galaxy SL users. You can now update your Galaxy SL via Samsung Kies! Just make sure you have the latest version of Kies installed on your PC. I would also recommend you to uninstall existing Kies software from your PC before installing the newly downloaded version, to avoid any problems while upgrading. The build date of the I9003DDKP3 - Indian Gingerbread firmware is 28-10-2011. Let us know if you have already updated your Samsung Galaxy SL I9003. I upgraded my 9003, and my wifi got a lot poor than before, it reconnects every 2 min, it crazy. Were all the previously installed apps and data restored after upgrading the firmware? Try restarting the device once, and try again. If that doesnt work either do a factory reset from Setting > Privacy. Note: Factory reset will clear all the installed apps and data from your device, make sure to take a backup! XXKPQ is not for India, ONLY firmwares starting with DD*** come with INDIAN CSC! You must have flashed some firmware for some other region be4, so now ur getting the update for that region. The latest firmware for India is DDKPG and is a 2.3.5 Gingerbread firmware! Updated mine using Kies. Works perfect. Glad to finally use gingerbread now. Gr8! Did u find any improvement in performance after the upgrade? The only remedy for the Wifi disconnection problem is to use a static IP for wifi in your phone. Configure the static IP for Wifi in your phone and the problem gets resolved. Though 2.3.5 is stable it is not without bugs. The battery drain is huge and the battery is lasting only for barely 1 to one and half day. The display is occupying around 35% of battery which is very huge. Waiting for samsung to release a bug fix for this. I don't think we will see an official update from Samsung but from the Android development community we can surely get ICS running on Galaxy SL! my kies is not detecting the firmware update for galaxy sl!!! im 4m kolkata. What do i do?? Uninstall any existing version of Samsung Kiea and then reinstall from scratch.. download drivers from Kids itself... it has to work..
Let me know if ur still facing issues..